Get our best shuttle rates when you make your reservations online. View prices for transportation services with Peak 1 Express by selecting your service area below. All rates listed are for one-way service. If you will be joining us for shared group shuttle service or our discount shuttles, please note that there will be other stops to accommodate other guests. The rates listed above are for online bookings only. Booking online guarantees that you will get our best rates. If you choose to book by phone, your shuttle fare may be more expensive. Also, multi-person discounts valid for guests traveling on same shuttle only. Looking for the best deal on Denver Airport shuttles? Check out our Discount Shuttles, with conveniently located pick-up and drop-off locations to help you save on your airport transportation. When you take the Peak 1 Express shared shuttle, you experience the most premium service of transportation at the best rate around. 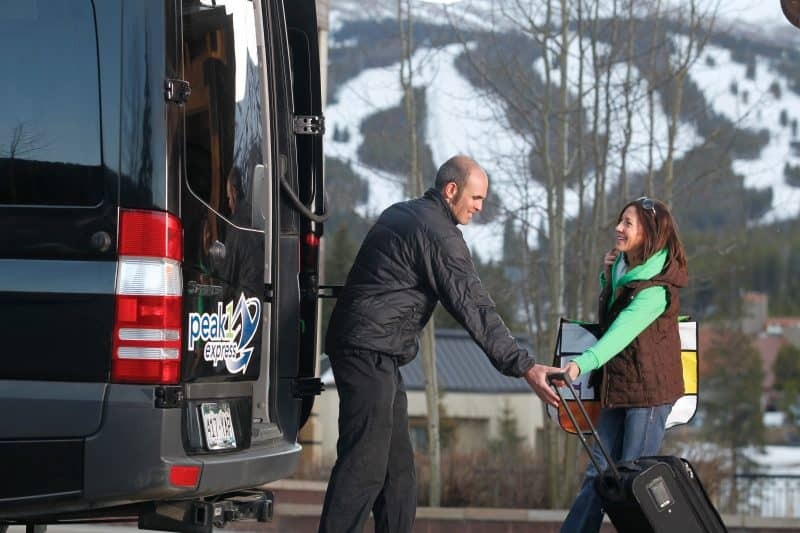 Guests of our shared shuttle have the option of being picked up or dropped off right outside of their door or from one of our various discount shuttle locations around Summit County and the Vail Valley. Depending on your pick up point, we may already have other guests on board or we may be picking up a few more after you. After everyone has found their comfortable, bucket-style seat aboard our luxurious Mercedes Sprinter Van, our professional driver will transport you to your drop off point while you relax and enjoy the complimentary wi-fi, water, and the gorgeous scenery of the Rocky Mountains. There’s no need to burden yourself with unsafe road conditions and endless traffic updates in a rental car you’re unfamiliar with if you’re traveling from DEN or EGE to Colorado’s mountain resorts. Instead, leave the driving to us! 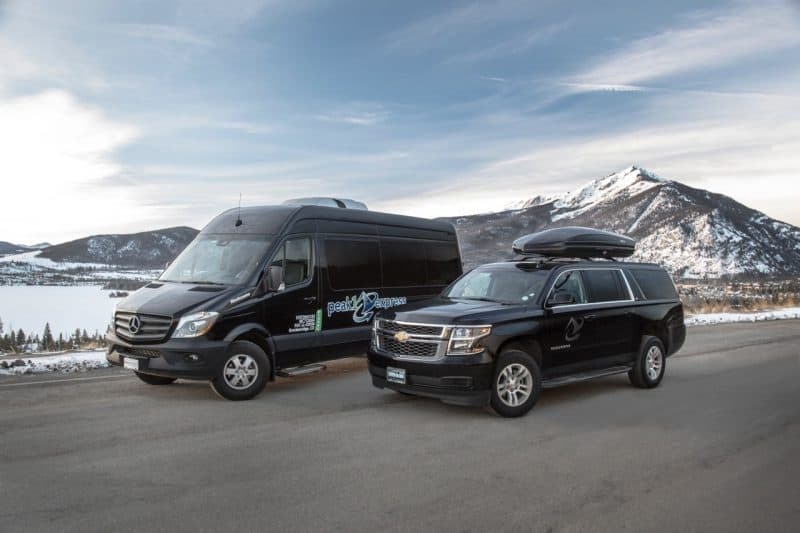 Peak 1 Express provides efficient and economical transportation that will get you and your traveling companions to the Colorado Mountains and back. Oversized bags /boxes (golf, bike, large instruments, etc) are subject to additional charges. Current Airport Shuttle Rates are listed above for transportation service from DEN including our Breckenridge airport shuttle, Vail airport shuttle other Summit County resorts, and Edwards. Our Colorado mountain shuttle rates are always published online, so you will know the price you’ll pay before you book your reservation. Hate hidden fees? So do we, which is why our listed prices always include any applicable fees and taxes. Our advertised online price is always the total price you’ll pay! Booking last minute? No Problem! Unlike other shuttle services, we don’t take advantage of travelers forced to book last minute. At Peak 1 Express, airport shuttle rates are the same for everyone, even if you need transportation right now! Book now and avoid “last minute” surcharges. Check out our Discounts for any available savings for groups, kids, transfer station shuttles, ski & snowboard gear and more! There’s no need to burden yourself with unsafe road conditions and endless traffic updates in a rental car you’re unfamiliar with if you’re traveling from DEN to Colorado’s mountain resorts. Instead, leave the driving to us! 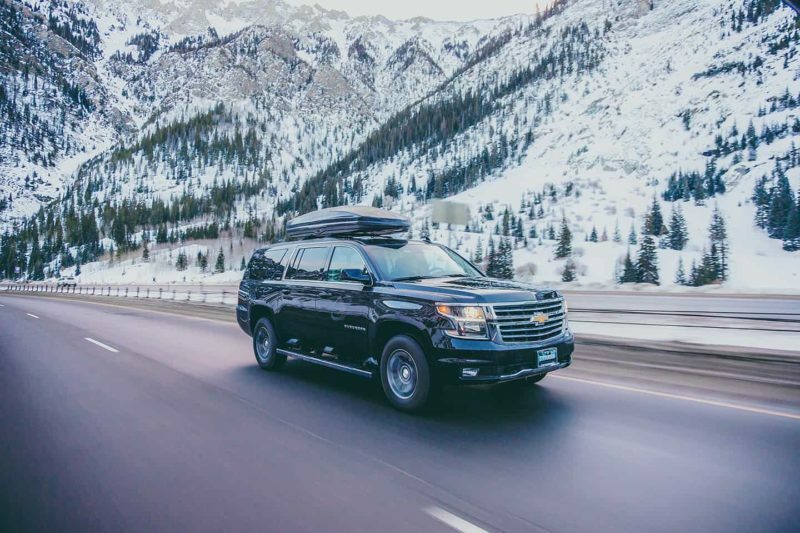 Peak 1 Express provides efficient and economical transportation that will get you and your traveling companions to the Colorado Mountains and back. We service all Summit County locations including Breckenridge, Keystone, Silverthorne, Dillon, Frisco and Copper Mountain. We also service most Eagle County locations including Vail, Beaver Creek, Avon and Edwards. Airport shuttle rates vary depending on the time of year so consult the rate charts on this page for shuttle rate pricing during the time you’ll be in Colorado. Don’t sweat the small stuff; let Peak 1 Express worry about the driving and you can worry about the having fun! The rates above represent your total cost: no added fees!